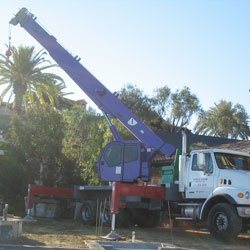 Purple Crane has been providing the Rancho Cucamonga area with high quality crane rental services since 1983. With 30 years of industry experience and having completed more than 75,000 lifts, we are your mobile crane experts. 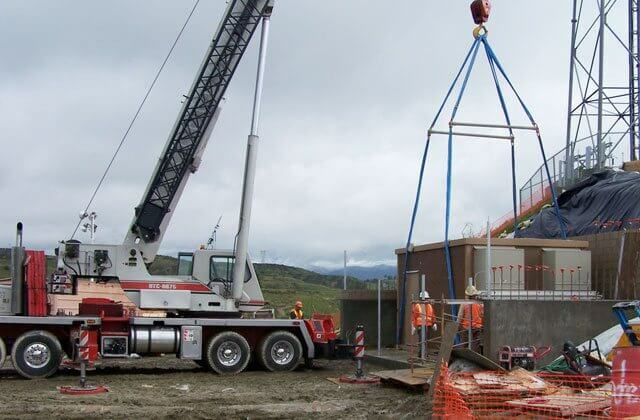 We specialize in offering exceptional crane operation services, as well as high quality rentals of heavy- and light-duty cranes, trucks, and trailers. We are available 24 hours a day, 7 days a week, and have the resources to handle any crane-related job. Pine Trees, Palm Trees, etc. We also have vans, trucks, trailers, rigging equipment, and man baskets. 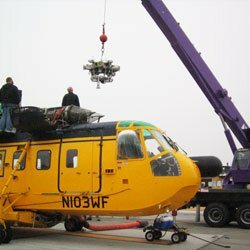 All of our lifting equipment is routinely inspected and serviced by our experts to ensure that we are ready to safely move, lift or transport any item in Rancho Cucamonga, even when we receive very little advance notice. In addition to renting well-maintained cranes at great rates to our Rancho Cucamonga clients, we also offer a team of NCCCO-certified crane operators. Our employees have an impressive amount of training and knowledge, and our operators all have between 9 and 40 years of hands-on experience in driving cranes, working with riggers, and lifting a wide variety of items. 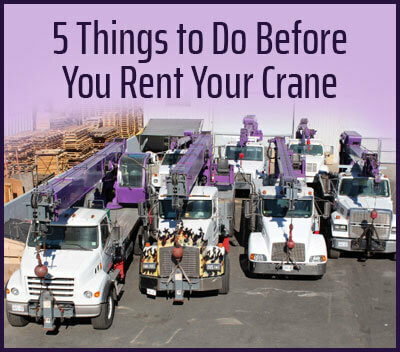 When you call Purple Crane, we'll determine the best crane for your job by asking a series of questions pertinent to the lift you want us to accomplish. With our thorough calculations and considerations at the time you order your crane rental, you can trust that your crane will be able to handle your job. 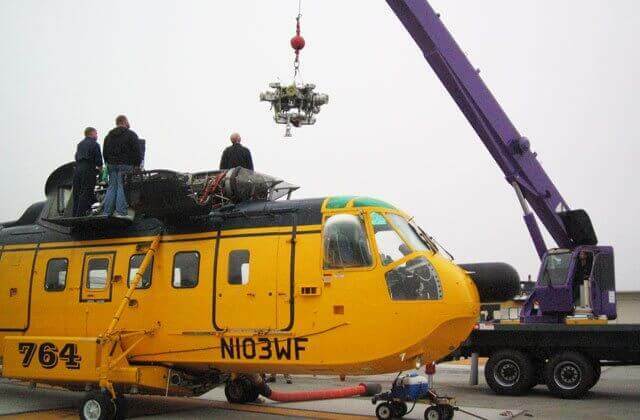 We will arrive to your Rancho Cucamonga job at the specified time with a crane that is equipped with the most commonly used rigging equipment. Our operator will carefully maneuver onto your worksite and balance the crane or boom truck at the designated spot. Any assembly will be completely quickly, so that your rigger can immediately get to work. 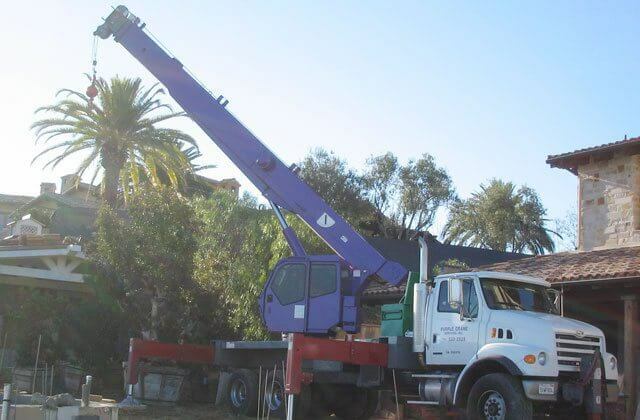 Having the equipment you need at the time you need it with as little downtime as possible is why Purple Crane is known as Rancho Cucamonga's best value for crane rentals: our high quality crane rentals save you time and money. Call us now to learn more about our cost-efficient full-service crane rentals available in Rancho Cucamonga. We can provide a crane rental and operator, anytime of day. Our light duty cranes can be rented for as little as two hours, and heavy duty cranes for as little as four hours. We are standing by 24 hours a day, 7 days a week to take your call. We frequently work with landscapers in Rancho Cucamonga to assist with their heavy lifting. We can move a wide variety of landscaping objects, such as boulders, trees, and fountains. We do it all. We can even obtain an insurance certificate within a day so that we can offer our services on short notice. 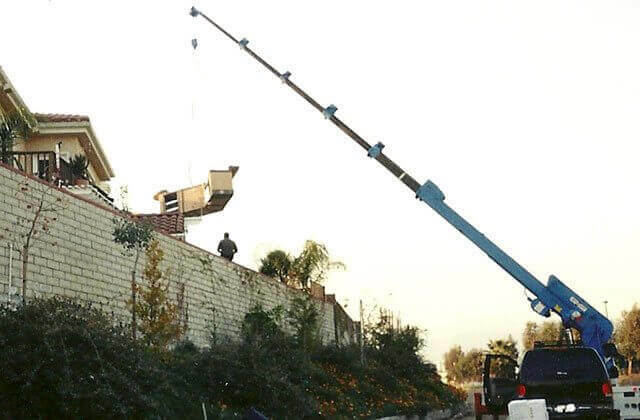 If you are looking to remodel the outdoor space of your residential or commercial property in Rancho Cucamonga, Purple Crane can help with the placement of any large items that can't be easily moved or disassembled. We have been helping remodeling contractors and homeowners for the past 30 years when they needed a crane to lift and place their spas, hot tubs, swim spas, gazebos, sculptures, sheds, barbecue islands, barbecues, and more. We can also help transport these items to or from your property. Call us today for a quote. 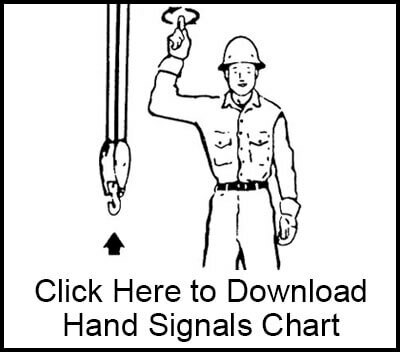 Additionally, we can supply a second crane operator to assist your rigger. No matter the size of your job, we will ensure that your item(s) get moved quickly and cost-efficiently, whether the building materials need to be moved to another part of the worksite, on top of a building, another Southern California jobsite, or to the scrap yard. 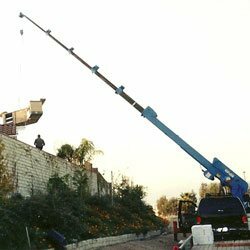 Purple Crane is the preferred choice when you need to lift shipping containers, railroad cars or large crates in Rancho Cucamonga. We will use our heavy-duty mobile cranes to lift one or a number of shipping containers. We also have trucks with trailers to relocate one or more shipping containers to any destination within Southern California. Our professionals will always determine the best crane and/or trailer for your needs in order to complete your lift safely and cost-efficiently. Purple Crane has been moving heavy machinery and equipment in Rancho Cucamonga for three decades, and can be entrusted with even the most expensive of machines. We have safely lifted and transported large appliances, printing presses, manufacturing machinery, medical equipment, and more. No matter its size or shape, we can lift it. Our drivers will get our mobile crane to you on-time and be prepared to work. Call us today to reserve your high quality crane service. Purple Crane works with HVAC contractors across Southern California whenever they need to install and/or remove a heating or air conditioning unit in Rancho Cucamonga. 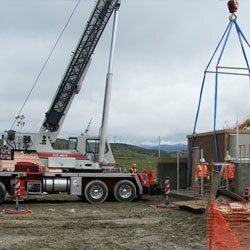 We can schedule a crane rental well in advance of your job or accommodate last minute, emergency requests. Just speak with one of our crane experts about the dimensions and weight of the air conditioner to be moved; we'll take it from there. We will reserve the exact crane you'll need to get the job done effectively, but at the lowest possible price. Purple Crane will always pick the right lifting equipment for your job, the first time, every time. Call us today for all of your crane-related needs in Rancho Cucamonga. We offer affordable rates, a great selection of cranes, and expert crane operators. We welcome credit cards, cash and checks, or can open a credit account for those who qualify. Purple Crane is completely compliant with Federal OSHA requirements, and stays on top of changing regulations and best practices through its membership with SC&RA (Specialized Carriers & Rigging Association). We are also fully insured by NBIS, a company that specializes in insuring the transport and construction industry.